Discover the Science of Medical Rejuvenation! At Huma-Netics, we provide a diverse range of medical and cosmetic procedures	and services that are designed to help patients live healthier, happier	lives. Whether you are looking for a way to boost your nutrient intake,	trim fat, balance your hormone levels, or improve your sexual vitality,	we have a safe and effective solution available. We are proud to have Our Medical Director Joseph J. Alshon who is	board certified by American Academy of Physical Medicine & Rehab, American Osteopathic	Congress of Rehab Medicine, Pain Medicine Subspecialty certification by	ABPM&R and American Board of Pain Medicine American Academy of Anti-Aging	Medicine.OWe have an advanced registered nurse practitioner (ARNP) who	is board certified in family practice and anti-aging medicine. We have qualified medical staff. We offer procedures and services for a wide range of needs. We truly care about your wellness. American Academy of Physical Medicine & Rehab. Ms. Bertha Osorio-Campbell is a compassionate and dedicated nurse practitioner	serving men and women in South Florida. She was born in Nicaragua and	moved to Miami at the age of 4, where education has always been her growing	foundation. 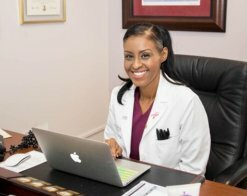 Nurse “B” earned her Master’s degree as a Family Nurse	Practitioner from Florida Atlantic University and is nationally board	certified by the American Nurses Credentialing Center. She worked for	7 years as a registered nurse caring for adults and premature infants	in the intensive care unit as well as teaching nursing students prior	to becoming an advanced practice nurse. Nurse “B” has her specialty in functional/integrative medicine	as well as anti- aging and hormone replacement. Nurse “B”	is known for treating the person as a whole and caring for their individual	needs and is devoted to improving the overall health of her patients. Nurse “B” is fluent in both English and Spanish. She is adept	at treating a variety of conditions from joint pain to intestinal and	gut disorders with a focus on preventative and natural remedies with a	focus on optimum wellbeing. Nurse “B” has also studied and mastered the field of medical	aesthetics, which includes the use of Botox, Fillers and fat transfers	as well as other medical cosmetics procedures such as PRP skin resurfacing	and medical micro-needle treatments. Outside of work, Nurse “B” strongly advocates for health by	routinely volunteering and serving on reputable charities that aim to	empower individuals of all ages to take their health to the next level. She enjoys spending time with her family and friends, traveling and being	a part of her community and her church family.